Color Your Calendar, Create Your Year…. Be the Artist of Your Life! There is no calendar available as a better tool for tracking personal life patterns and projects than the Spiral Labyrinth Calendar. By coloring dates of importance or significance, you are enabled to see patterns in events, as well as the distance in time between the present and projected taskcompletion dates. As long as we are oblivious to the patterns, change and improvement is not an option. By recognizing patterns, we can either choose to accept what we discover, or make some shifts and changes. Using color, you can indicate personal cycles, energy or mood changes, headaches, fatigue, returning ailments or energy bursts and productivity. Becoming aware of the pattern of these events can greatly aid in using these cycles to assist you rather than take you unaware. When able to see patterns, we become able to treat the cause, heal more effectively and utilize your energy to maximum potential—working with your body instead of against it. You can also use the calendar for tracking your successes related to your health. Color code your exercise days, types of workouts (upper body, legs, aerobics, walking, etc. ), non-smoking/drinking days, successful dieting…Color code your diet for evaluating how well you really are sticking to it! For family planning, we know of no other calendar on which you can follow your personal cycles a year-at-a-glance and visually see the patterns of your fertility. Choose a color to represent your menstrual flow and chart it on the calendar each month. Do the same with a new color for ovulation. The result will be a very visual understanding of your personal body rhythms. Again using color codes, the Spiral Labyrinth Calendar can be used for project planning, employee scheduling, and keeping track of important dates, like Pay-days or project deadlines. Color in the dates on the calendar which indicate periods of idea development, periods of production, project deadlines. Color periods of high productivity or sales one color and periods of low production another. Color code each employee and keep track of work schedules for the whole year. The result will enable you to visibly examine the productivity patterns and inner workings of your company. By tracking your time spent with different people, and your time spent alone, you’ll be able to see a graph of your relationships. You can track both “Quality” and “Quantity” in relationships in order to identify what is actually taking place. Once known, you can make new choices. Use the Spiral Labyrinth Calendar to plan goal achievement dates, personal projects and accomplishments. Color code vacations, personal productivity, important holidays or personal days of celebration. Combine any or all of these suggestions and more to represent your personal pictorial journal. You will see your life in a colorful and beautiful way. 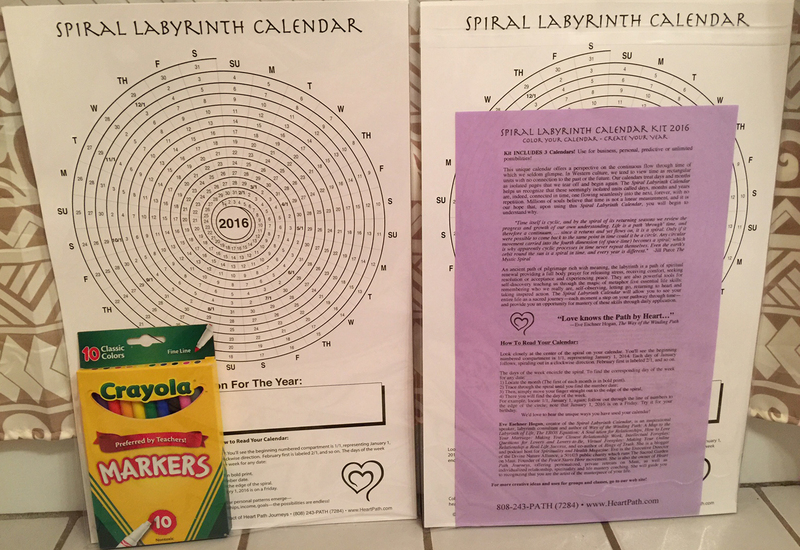 Below the Spiral Labyrinth Calendar is a box for writing or drawing your vision or goal for the year. Take some time to carefully consider your goals. You may choose something as simple as one word such as Peace, Health, or Success, or an affirmation such as, “I am creating success for myself and others,” etc. It could also be a goal, “I will publish my book,” or anything else of meaning to you. After all, it is your vision, your year, your life! Create it with a constant reminder to focus and align your thoughts, words and actions with your personal vision. Look at it everyday and watch it become a reality! Track your meditations, worship, prayer, church visits, service, labyrinth walks…any spiritual practice! So often we think we aren’t doing enough when, once colored and “graphed,” we can visually see what we are doing! If you are familiar with walking the labyrinth as a metaphorical journey, you will LOVE the recognition that you are walking on your spiritual journey through time, all of the time, every where! Each moment is a step on your spiritual journey. The Spiral Labyrinth Calendar will allow you a “bird’s eye view” of how spiritually you are living your life…and allow you to self-adjust if necessary. Sometimes we think that we are emotionally stuck, “always” feeling a certain way …or someone says, “you always seem so angry” and you angrily reply, “I am not!” Our emotions are like a piano keyboard in terms of range. By tracking your moods and emotions you can come to see patterns in where your “home note” is emotionally. Once recognized, you can take active steps to stretch your emotional range and consciously bring more joy and happiness into your life. Tracking activities and emotions simultaneously will reveal to you personal patterns and valuable information for making steps toward transformation and strengthening. The Spiral Labyrinth Calendar is magnificent for tracking moon and planetary cycles and their effect on you. Color code the calendar to match your astrological charts so that at a glance you can make daily plans accordingly. You will instantly see any patterns developing in the Astrological effects on your daily life. Simply explore with your favorite colors. You may choose to color each month a separate color, creating a beautiful rainbow-like effect, or use two alternating colors for easy recognition of each new month. You can color code the first day of each month or put symbols on the birthdays of all your friends and family. Have everyone who comes to visit color their birthday in their own special way. The possibilities are truly endless. Perfect for Groups, Classes and Workshops! Great for tracking individual student’s projects, progress and behavior in the classroom. When one sets a goal on the Spiral Labyrinth Calendar, we begin to see that each day is a step on the journey toward that date….but if we want to achieve the goal by that date, we must do something toward reaching that goal on a daily basis. The calendar is perfect for tracking that progress!